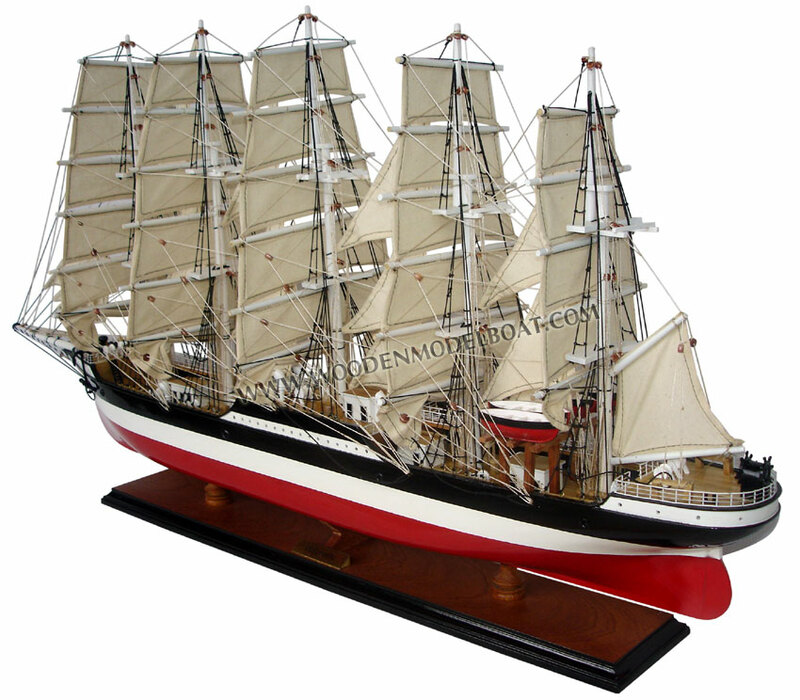 The Preu�en was a German steel-hulled five masted ship-rigged windjammer built in 1902 for the famous F. Laeisz shipping company and named after the German state and kingdom of Prussia. It was the only ship of this class with five masts having carried six sails on each mast within the world merchant fleet. Until the 2000 launch of the similar Royal Clipper, a sail cruise liner, she was the only fully rigged vessel (i.e. 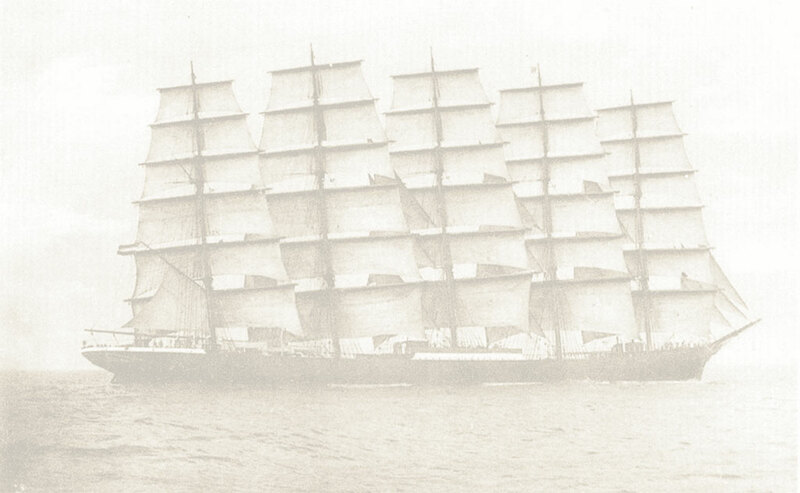 a ship carrying square sails on all masts) with five masts ever built. The Preu�en was built as hull-number 179 at the Joh. C. Tecklenborg ship yard in Geestem�nde according to the plans of chief designer Dr.-Ing. h. c. Georg Wilhelm Claussen, launched and christened on May 7, 1902. 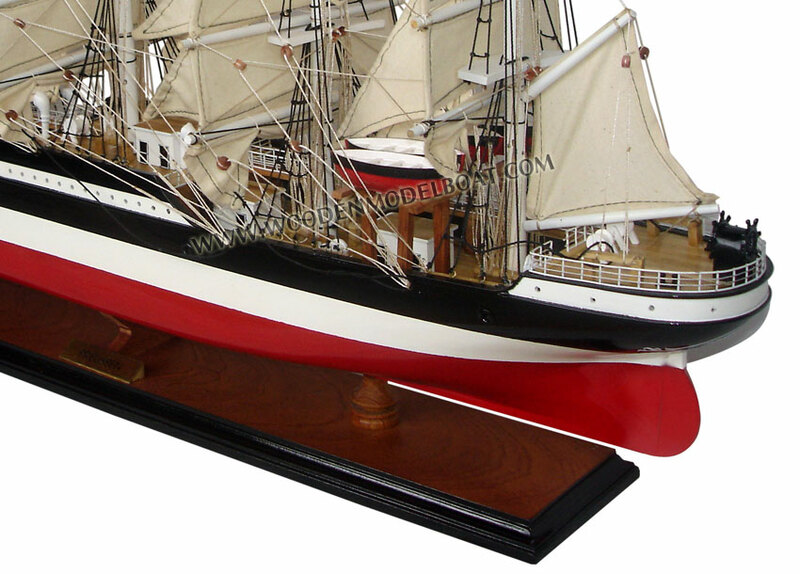 On July 31, 1902, the ship was commissioned and left the harbour of Bremerhaven the same day to her maiden voyage to Iquique under the command of Capt. Boye Richard Petersen who assisted naval architect Claussen in his plans. 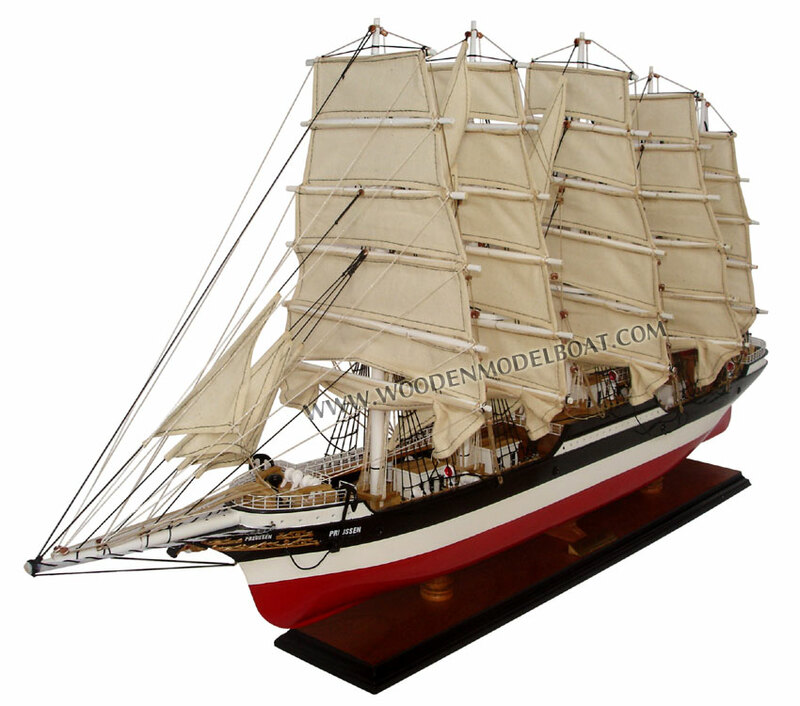 The basic idea of building such a ship is said to come from famous Laeisz-capitain Robert Hilgendorf, commander of the five-masted steel barque Potosi. Story has it that emperor William II, while visiting the Potosi on June 18, 1899, asked Carl H. Laeisz when the five-masted full-rigged ship will finally "come". This is also considered as an impulse to built the ship. First construction plans were found in the residue of Carl Ferdinand Laeisz, grandson of founder Ferdinand Laeisz and son of C. H. Laeisz, who died early at an age of 48 in 1900 even before his father Carl Heinrich Laeisz who died in 1901. 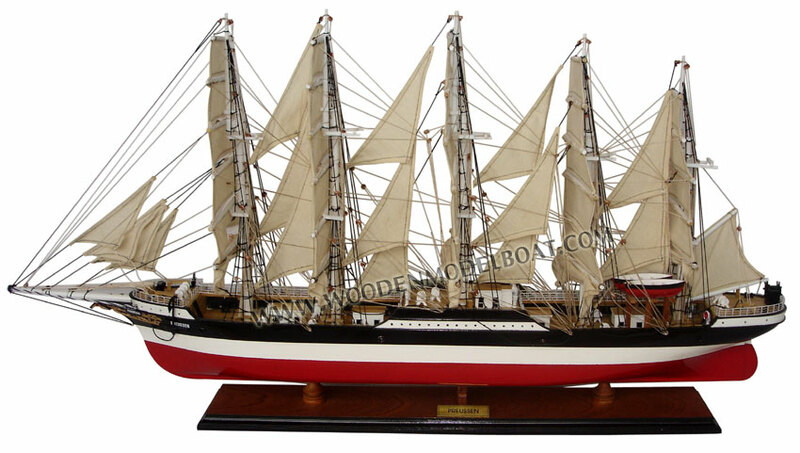 The ship was subsequently ordered in November 1900. 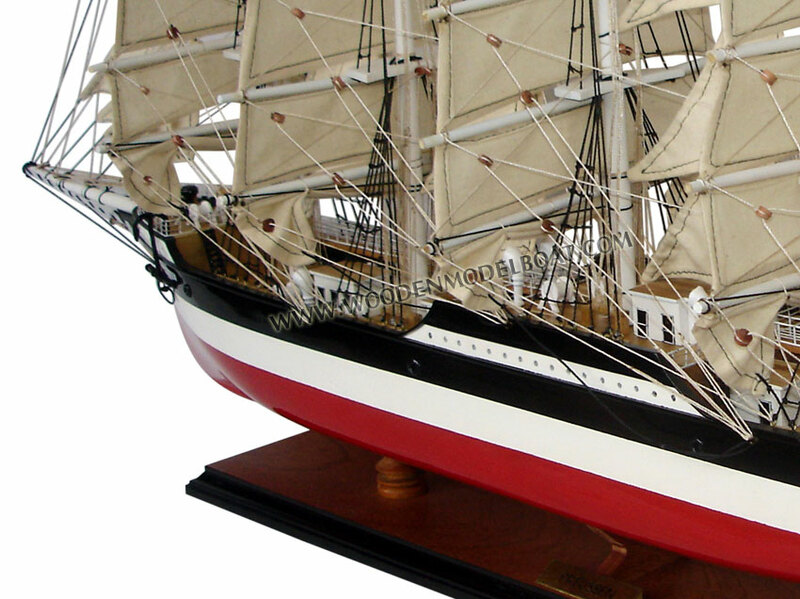 The sturdily built ship could weather every storm and even tack at force 9 winds. In such conditions eight men had to hold the 6� ft tall double-steering wheel. 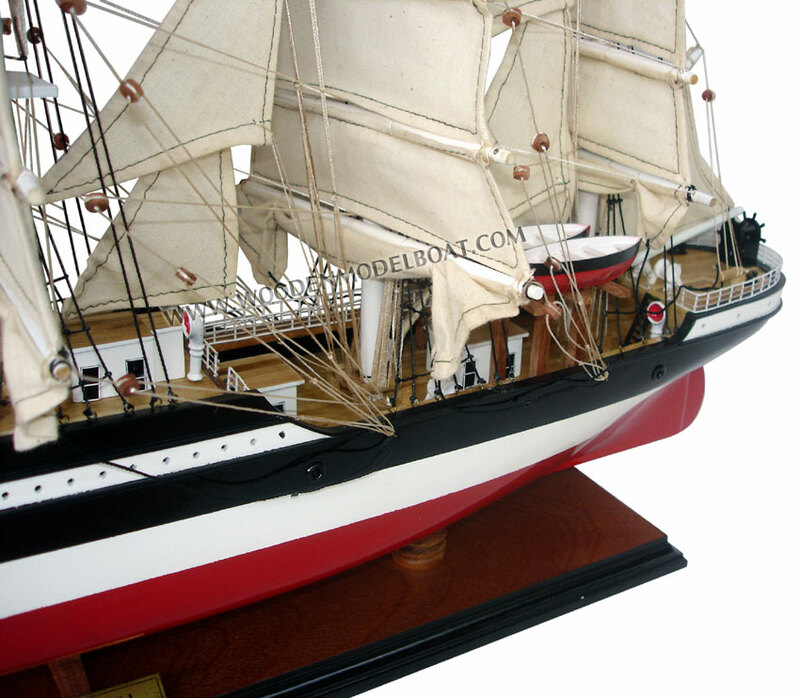 She was successfully used in the saltpeter trade with Chile, setting speed records in the process. Due to her appearance, uniqueness, and excellent sailing characteristics seamen called her the "Queen of the Queens of the Seas". In 1903 (February 2 - May 1) she sailed an unequalled record voyage from Lizard Point to Iquique in 57 days. She made twelve "round voyages" (Hamburg-Chile and back home) and one journey round the world via New York and Yokohama, Japan in charter to the Standard Oil Co. When she entered New York harbour, almost all New Yorkers were "on their legs" to see and welcome that unique tall sailing ship. Capt. B. R. Petersen was in company of his wife and his little son, both left the ship and returned to Hamburg later on in a steamer. The mighty Preu�en as she was named by many seamen had only two skippers in her career, captain Boye Richard Petersen (11 voyages) and captain Jochim Hans Hinrich Nissen (2 voyages and the last voyage). Both masters learned and developed their skills sailing such a huge sailing ship under capt. Robert Hilgendorf late master of the Potos�. However, on November 6, 1910, on her 14th outbound voyage under captain Jochim Hans Hinrich Nissen carrying a mixed cargo, including a number of pianos for Chile, she was rammed by the small British cross-channel steamer Brighton who, contrary to regulations, had tried to cross before her bows, underestimating her high speed of 16 knots (30 km/h). 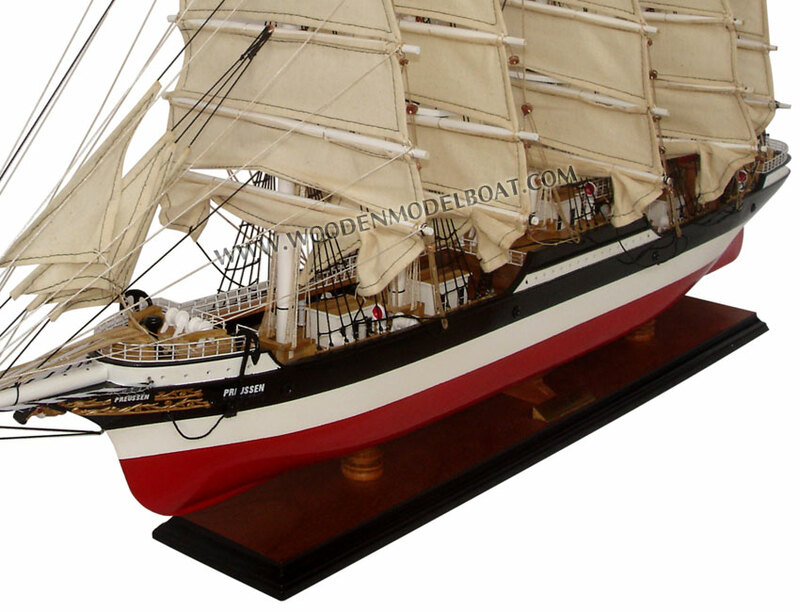 The Preu�en was seriously damaged and lost much of the forward sailing equipment (bowsprit, fore topgallant mast), making it impossible to steer the ship to safety. After several attempts to sail or pull her to nearby Dover had failed, she ran aground a beach (crab bay) during a November gale. While crew, cargo and some equipment could be saved, the hull with the keel broken was rendered unsalvageable. She sits in 6 m / 19.7 ft at 51�8.02′N 1�22.17′E﻿ / ﻿51.13367�N 1.3695�E﻿ / 51.13367; 1.3695Coordinates: 51�8.02′N 1�22.17′E﻿ / ﻿51.13367�N 1.3695�E﻿ / 51.13367; 1.3695. The Preu�en was steel-built with a waterline length of 124 m and a total hull length of 132 m. The hull was 16.4 m wide and the ship had a displacement of 11,150 tons, for an effective carrying capacity of 8,000 tons. The five masts were fully rigged, with courses, upper and lower topsails, upper and lower topgallant sails, and royals. Counting staysails, she carried 47 sails (30 square sails in six storeys, 12 staysails between the five masts, four foresails (jibs) and a small fore-and-aft spanker sail with a total sail area of 6,806 square meters or 73,259.17 sq ft (according to other sources 5,560 square meters (59,847.3 sq ft), which probably refer to the square sail area only). 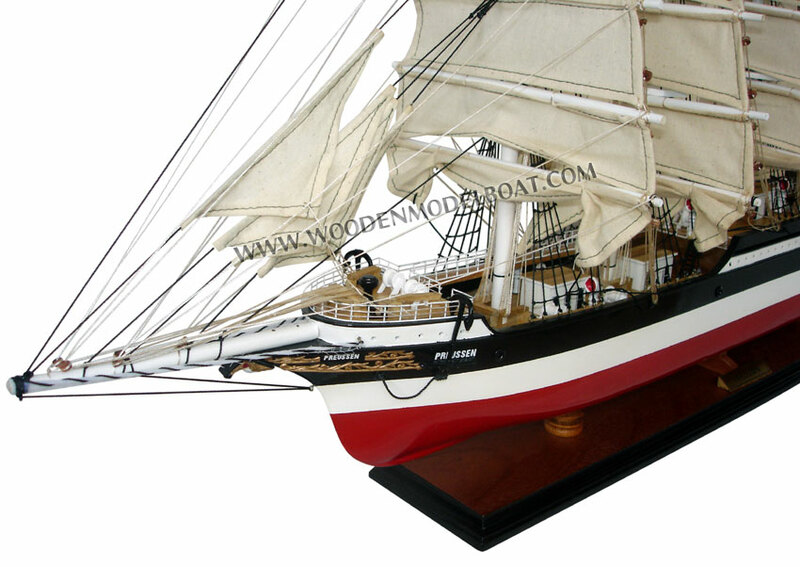 Not only the hull was steel: masts (lower and top mast were made in one piece) and spars (yard, spanker boom) were constructed of steel tubing, and most of the rigging was steel cable. All bobstays between jibboom and bow were made of massive steel rods and chains. The only wooden spar was the gaff of the small spanker fore-and-aft sail. The hoistable yards were equipped with special shoes to slide in rails riveted to the masts. "Jarvis' Patent" brace winches for the lower and top-sail yards were mounted before each of the five masts. The fall winches were of "Hall's Patent". She was designed as a so-called "three-island-ship", i. e. a ship with a third "high level deck" amidships beside the forecastle (41 ft (12 m)) and poop (65 ft (20 m)) decks. The midship island (74 ft (23 m)), also called the midship bridge, is named as well as a "Liverpool house", because the first ships equipped with that feature, came from Liverpool yards. Dry and well-ventilated accommodations for crew, mates, and captain, as well as the pantry and chart room were built in this middle deck. The main helm - a double rudder wheel of 6.2 ft (1.89 m) diameter with a steam driven rudder machine - was mounted on top of it, well save against the dangerous huge waves from aft. A second helm (emergency helm) was near the stern. Four huge main hatches were set in the upper main deck. Behind the foremast a little deckhouse contained the two donkey boilers that drove four steam winches, a steam capstan, the rudder machine, and a generator for electricity. Four lifeboats with davits were securely fixed on a tubing rack above the main deck before the aftmost mast. Under good conditions, the ship could reach a speed of 20 knots (37 km/h). Her best 24-hour-runs were 392 nm in 1908 on her voyage to Japan and 426 nm in 1904 in the South Pacific. The Preu�en was manned by a crew of 45, which was supported by two steam engines powering the pumps, the rudder steering engine, the loading gear, and winches. 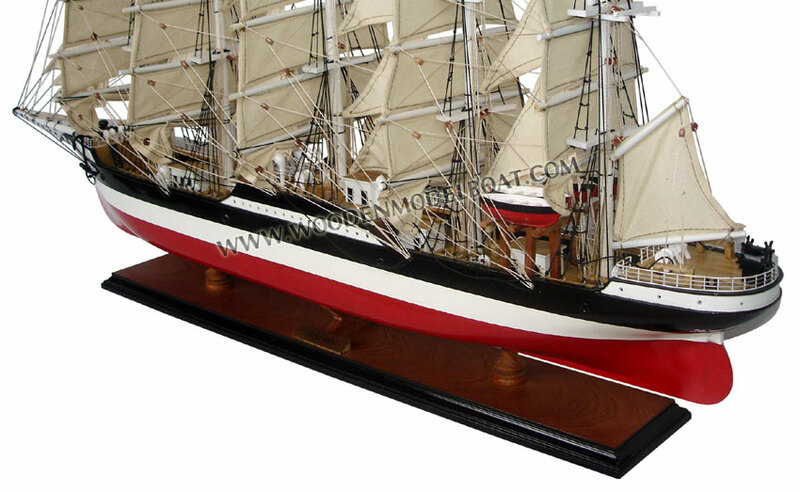 English seamen estimate her the fastest sailing ship after the clipper era, even faster than her fleet sister Potos�, and only a few of them were faster than her but with a considerably less cargo.